A weight bench is a perfect addition to your home gym. You can use them to do just about anything, and most of them have different adjustments for different types of exercises. We’ve put together this exercise bench buying guide in order to bring you the best of the best and to help you choose the bench that’s best for you. But before we get started, here are some things that you should know about exercise benches. Fold Up Storage: Some of the benches on our list fold up so they can be slid into your closet or under your bed, which is really useful when you have limited space in your home gym or office. Type: There are a few different types of exercise benches, including adjustable ones that can be used for several different heights and all the exercises that go with them. Other types include flat benches and incline ones. Leg Bar: Some of these benches have a leg bar that helps with lower body exercises and helps to hold your legs down when you’re doing upper body work as well. It’s really useful for a total gym. Weight Capacity: The weight capacity of the bench represents the total amount of weight that you can throw on it, which includes both your body weight and any other equipment you might be using, like dumbbells. Dimensions: The dimensions of the bench can help you figure out where you’re going to put it in your home, or where it’s going to fit in your gym. Some can even be stored, so this might not be an issue. Warranty: The warranty outlines the amount of time that you have to report a manufacturing defect and get a refund or replacement for the product you have purchased. It’s a great insurance policy if something goes wrong. Now that you know all there is to know about exercise benches, we can get to our exercise bench reviews. We’ve researched and reviewed a large selection of benches in order to bring you the top ten. Check out our top pick and budget pick first, as they are our absolute favorite exercise benches. The rest of our list is pretty amazing as well, so don’t stop there! There’s a bench for everyone on this list! Our choice for the best exercise bench is this one from Bowflex. 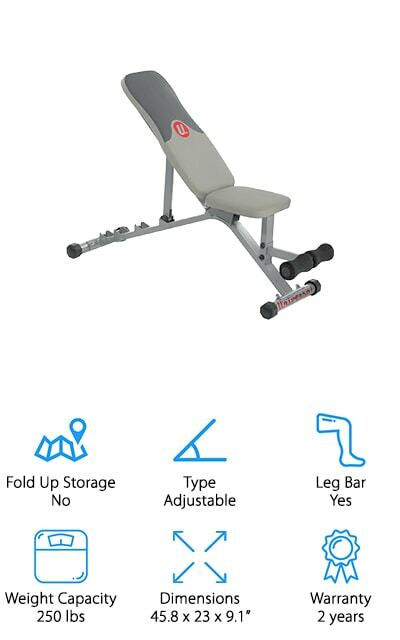 Bowflex is, of course, a leading name in home gym equipment, so you know you’re getting a quality exercise bench in this product. 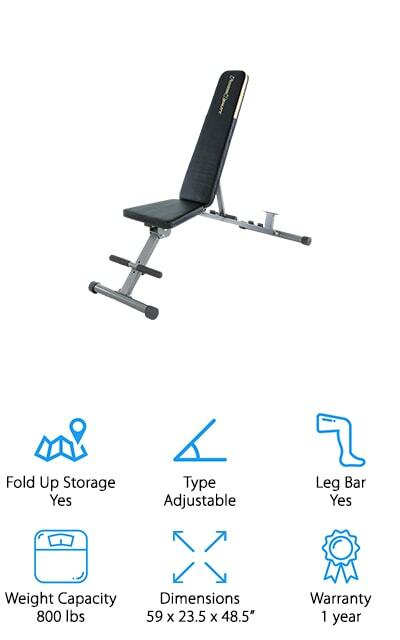 It’s an adjustable bench that you can use for free weight training, and you can move it into four different positions so that there are 30 different exercises in total that you can partake in. We think that’s pretty amazing. It has a hold-down brace for your legs if you’re looking for a decline position workout. The bench helps you correct your posture during weight training. The size of this bench definitely maximizes your space, so you can do the best with your workout even in spaces with the smaller home gym. We love that it helps to stabilize your position and make you safer and more effective. You get continuous resistance and, therefore, a better workout for your entire body. One of the best, most inexpensive exercise benches for sale is Marcy’s. This Flat bench is great for getting a full body workout. It’s made of heavy-duty materials and provides you enough to support to do the workouts that you need to do. It has a maximum weight capacity of 300 pounds, so you won’t be able to overdo it if you plan to use this bench. It’s coated with powder to reduce wear and tear, so you can use it in your home gym forever. You won’t have to leave the house to get a complete workout. You can use this bench to target your different muscle groups flawlessly, and it doesn’t take up the space of a ton of other equipment. We love how well-constructed it is, with high-density foam and 14-gauge steel tubing to help support you during your most intense workouts. This bench is the perfect companion to free-weights or bands. 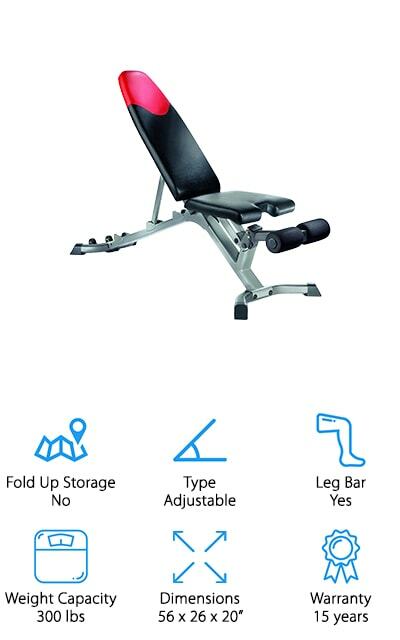 This Universal weight training bench can recline and move into five different positions, at different levels so that you can perform a plethora of exercises. It adjusts to -10, 0, 15, 30, and 45 degrees so you’ll have the perfect position for whatever exercises you want to do. It has a contoured shape and there are five-inch foam rollers that help to make your workout as comfortable as possible so that you don’t have to deal with that particular challenge while you’re trying to lift weights. There are stabilizing levelers that make the base stable on just about any type of flooring so you won’t be afraid of the bench tipping over. 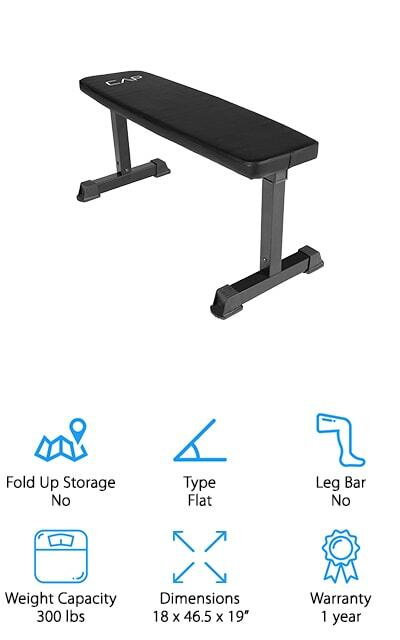 Overall, this is a pretty heavy-duty home gym bench that you won’t regret fitting into your area. We love how stable this bench is. It can really take a beating and still keep you supported and in the best position for your workout. This exercise bench from Escape Fitness is a great all-around fitness staple that you can use for a wide variety of workouts. You can get all of your cardio, total body strength, and even other great workouts done with this deck bench. There are so many different exercise styles and routines that you can partake in with this versatile deck bench, including step exercises, circuit training and other routines that you wouldn’t be able to do without it. 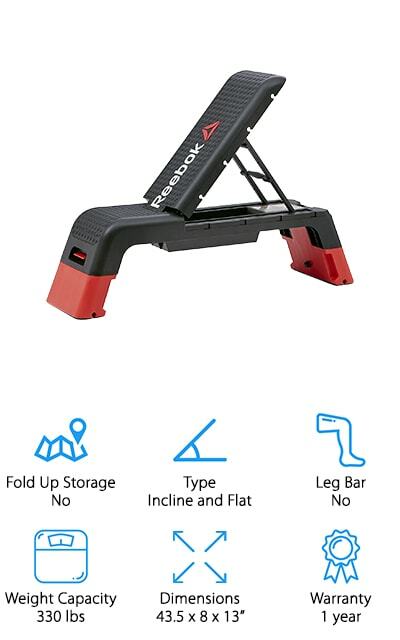 We love that you can purchase this single piece of equipment and you probably won’t need much else in order to get an effective workout right in your home. 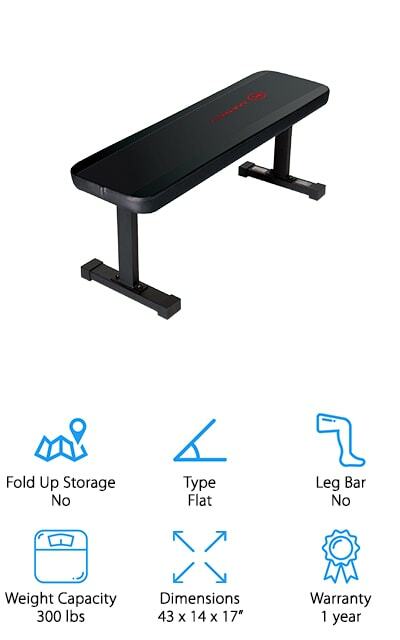 Even if you own a gym or club, this professional workout bench is extremely high quality and will fit in perfectly with the other equipment that you have available. It sets up to two different heights for use with step exercises and range of motion, as well as an adjustable backrest! Marcy is on our list again with this adjustable bench. The back pad can be moved into six different positions due to the sawtooth adjuster, which is perfect for modifying the bench into incline and decline positions as well as the others. The dual-position leg developer can help you work your legs as well as the rest of your body when you’re doing your workout, which is a nice touch. It has a weight capacity of 300 pounds and it’s durable with extra padding. The frame is powder-coated steel and the roller pads are super comfortable. This bench doesn’t fold up, but you can move it because it has a transport handle and wheels that you can use to take it wherever you want. Whether you’re looking to do leg curls or weightlifting, toning routines or sit-ups, this is the perfect bench for you. We’re sure that you’ll love it as much as we do! Reebok is a well-known and respected name in the exercise and fitness world, as well as creating numerous equipment for sports activities. Their deck gym bench is no different and is just as high-quality as you might expect it to be. There are three different positions and angles that you can move the bench into, including flat, incline, and decline areas. There are places to attach resistance tubes so that you can get various workouts done however you’d like to them. 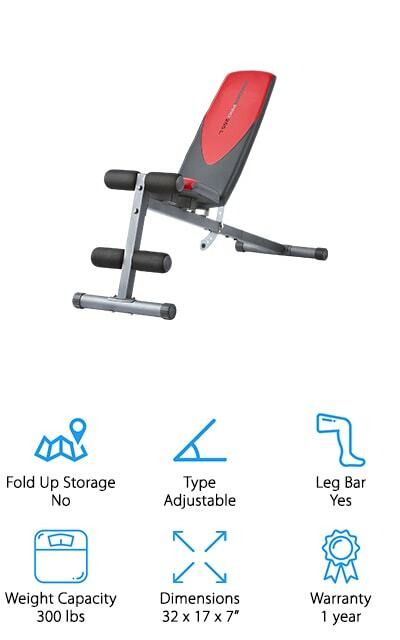 It also can be adjusted into three different height positions so that you get a more varied and customized workout that you can do right in your home. The surface of the bench is a texturized rubber that is non-slip, so you can do all of your intensity workouts without fear of sliding off of the bench or the bench tipping over. It’s the quality you’ve come to expect from Reebok wrapped up in a convenient bench. 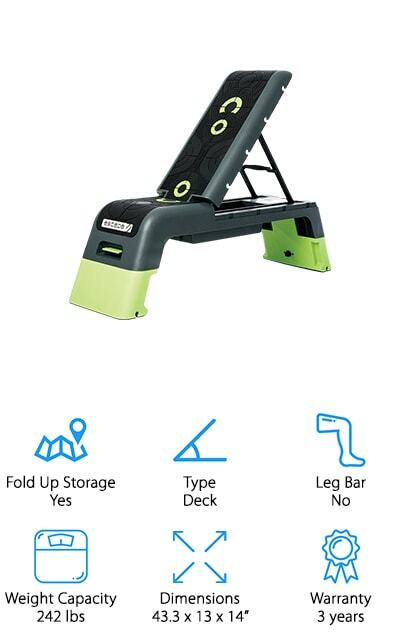 This foldable exercise bench from GYMENIST is great to take with you when you’re traveling, or even just for folding up perfectly under the bed at home. It can get into all the positions you need, from incline to flat and decline. It comes with a back cushion that is adjustable up and down the back of the bench so you can put it where you need it the most. It comes fully assembled so you don’t have to worry about fiddling with instructions, and it can hold up to 500 pounds which is pretty amazing if you ask us. This allows you to do even the most intense weightlifting without damaging the bench. The seat can also adjust into three different positions and comes with a cushion so that it’s always comfortable to use no matter what exercise you’re using it for. It’s a great space saving piece of equipment that you’ll love in your home gym! This Fitness Reality Bench is a beast! It’s perfect for user heights up to 6-foot-four-inches, which some other benches can’t really accommodate, as well as having an 800-pound capacity weight limit. This, paired with the backrest that can be moved into twelve different positions and front leg adjustment that goes to two separate positions, this bench is killing it for your workout! There is a leg bar that you can detach; when it’s on, it can be moved into three different positions as well. This entirely adjustable upper body bench is a great tool for sculpting the body you’ve always wanted. It’s great for dumbbells and strength training, as well as just about every other workout you could imagine. And each of the components is arranged and adjusted independently of each other, a great feature for someone who likes to change up their different workouts. This is a great, highly-versatile bench with so many uses! The frame on this CAP barbell bench is amazing! It’s coated with powder so that it won’t wear down or rub off anytime soon, and the bench itself features comfortable box-stitch padding that will keep you from being uncomfortable during your workout. It’s great for dumbbell exercises, as well as routines that are based in your body weight or focus on strengthening your core. It’s a great tool for a variety of exercise programs, and perfect for tubing and band exercises as well. You can do most anything with this bench, and it’s a high-quality stable piece of equipment that will last you a fairly long time as well! You will have to assemble the bench, but it only takes a few moments and it’s a simple process that will give you a durable, comfortable bench that you can continue to use for the long haul. The 300-pound weight capacity makes it great for weight lifting exercises. The Weider Pro Ab bench uses several positions to get you the best version of your workout possible. It even includes an exercises chart so that you know exactly what to do and how to use the bench for the best results. You can use it with the weights that you already have as well. The seats are sewn vinyl, so they’re completely comfortable for all of your workout needs. The seat adjusts so you can target different muscle groups, and it includes a leg bar with four rolls to keep your legs locked down and secure your other exercises, or else as added resistance for leg presses. 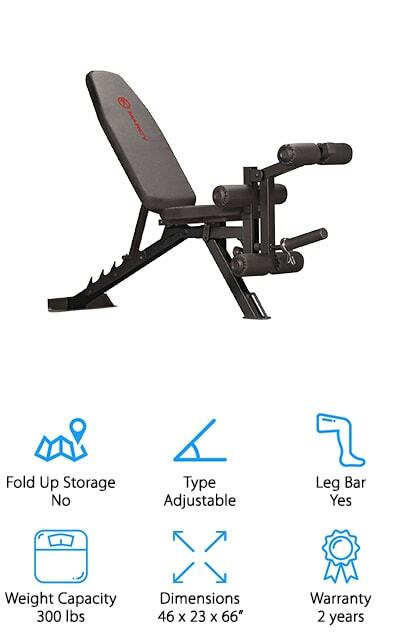 Our favorite part of this bench is the fact that it comes with a guide so that you have the proper form and can get your workouts done in the best, most effective, and safest possible way. Get your sculpting done in no time with this amazing bench!